The to-do list. The often dreaded list of tasks that direct us on how to get through our days, keep us in check and actually make sure that we are being productive. The list that we either feel completely lost without or feel we'll never get to the end of. This coveted to-do is often very much needed, but how do you make the most out of it without allowing it to overwhelm you? A few years back when I first decided that I wanted to dig deeper into offering business coaching services, I piled on my to-do list with tasks that I needed to do for my then online shop, my coaching clients and also my personal life. At any given day I would have over 15 items on my list with no clue HOW I was going to get it all done without working a full 24 hours. My to-do list was a cluttered mess and I felt as if I was always drowning in work but never actually accomplishing anything important. I would become so overwhelmed with all that I felt that I needed to get done that I would either give up and do nothing or just wing it for the rest of the day. Neither were helping my productivity. It wasn't because of laziness or because I couldn't handle my workload, it was simply because I sucked at organizing my tasks and deciding what should take priority in my day. When I sat down to plan out my week I didn't put any thought into my daily list other than what I knew needed to be done. I didn't take into account what tasks could have waited or what tasks needed to be done right then, which meant I often had to scramble to make deadlines which caused more frustration than necessary. 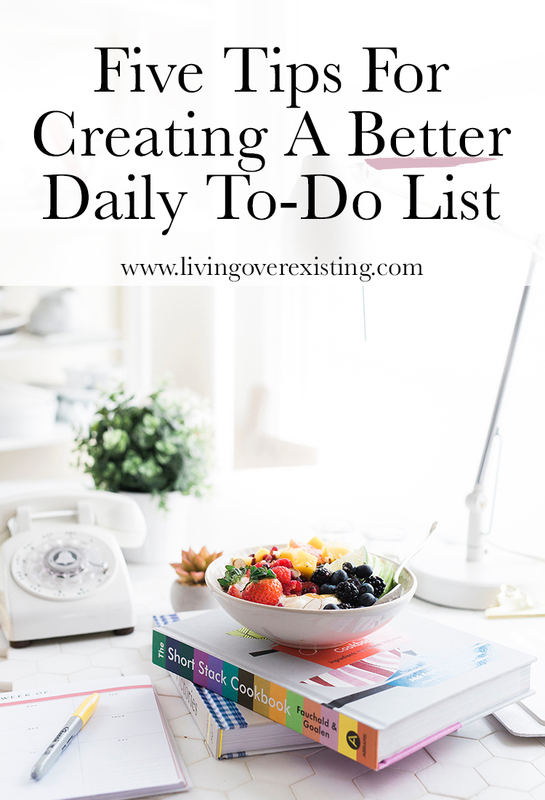 Over the years I have tried many different methods to help me get organized and effectively write out my to-do list each day. If you've been struggling with planning out your week and actually staying productive, here's where I've found can be the cause of your problems. For me, I am more likely to be a lot more attentive and less distracted at the beginning of the week. Which means I schedule out my most important tasks or large projects on Mondays and Tuesdays. I then save smaller tasks to accomplish towards the middle/end of the week. Pay attention to your work patterns. If you know you're out if it by Friday, don't wait until then to do your most important work. Also if you're working a day job, really take advantage of your days off when you can give more of your business the attention it needs. YOU DON'T KNOW THE DIFFERENCE BETWEEN A "TO-DO" & A "MUST-DO"
It was hard for me to realize that being busy did not equal being productive. Instead of piling on 20 different tasks in one day, spread them out over the course of your week and prioritize your must-do's over your to-do's. A "MUST-DO" is a task that will immediately affect your business or income. These can also be tasks that have quickly approaching deadlines that can not wait to be completed. For example, a must-do may be prepping for your client call the next day, uploading new products to your website or sending out invoices to clients. A "TO-DO" is typically a smaller task that is important but doesn't need to be completed immediately. For example, let's say you need to update your blog's sidebar. It needs to be done but if you don't get to it, it won't immediately affect your business as much as sending out invoices to clients would. another to-do may be scheduling out social media or clearing out your inbox. bit important but the world wont end if you have to push it to the next day. When creating your daily list, your must-do's should always be TOP priority. For scheduling out your daily Must-do's and To-Do's each week, the Ultimate Weekly Business Planner has the perfect layout to make sure you're staying on track. want a more productive day? learn the difference between a "must-do" and a "to-do" when planning out your week. I used to have a very bad habit of writing down a task only using three words or less. Then when I actually got to it I had no clue what the actual task was or when it needed to be completed. When you get ready to write out your list take a few extra seconds to really write out the little details of what needs to be done. Not only will it help you stay organized but it will also help your productivity because you won't be wasting time trying to figure out what exactly needs to be done. Lets face it, no matter how much of a work-a-holic you may be, its nearly impossible to work (and actually do great work) without taking a break. I've found that dedicating a good solid hour or two to work when I first wake up helps my productivity a ton! I reward myself with a 15-20 minute break then I'll work for another two hours. It helps to power through your to-do list when you know you have some down time coming up. It also helps you to make rest and self-care a daily priority. Sound off in the comments and let me know how you structure your daily task list!